A little north of the Sakura-bashi on the Sumida River is the Suijin-ohashi, a three span bridge with a through-arch center span. It is a steel bridge, painted bright blue to match it's name of 'water god.' It was built in 1989 but looks almost timeless in appearance. It has areas on the sidewalks (over the piers) where you can stand, lean against the railing, and watch the river flowing by. 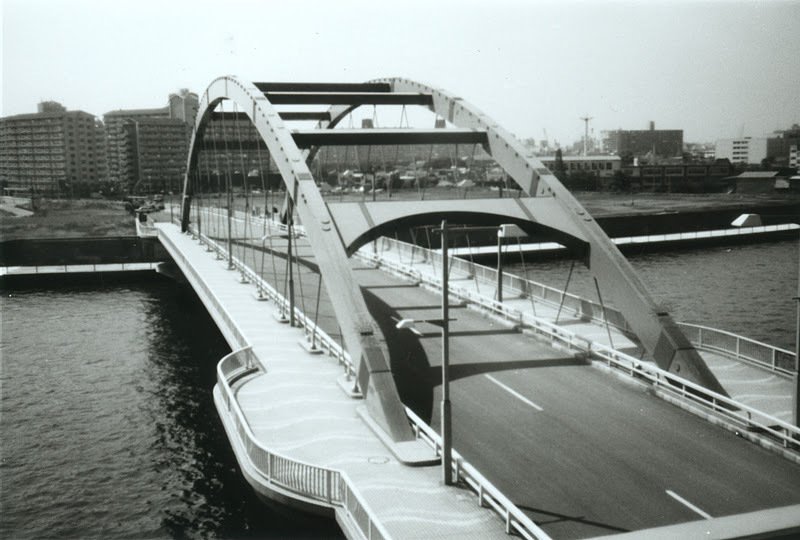 Tokyo's River Crossings: Suijin Bridge by Mark Yashinsky is licensed under a Creative Commons Attribution-NonCommercial-ShareAlike 3.0 United States License.